The Shiretoko peninsula is a special place. It has one of the highest densities of bears in the world, as a start (0.4 per square kilometer). It’s 65 kilometers of jagged mountains, threatening rocks and volcanoes protruding into the Okhotsk Sea in the far north of Japan. I went to this remote place to explore a Japan off the beaten path, to enjoy Nature, solitude. And I also went to experience again the thrill that I always feel when I am the margins of the maps, when I feel a bit lost. And I went to see the bears, but from a distance. I found everything that I was looking for. In this narrow peninsula there are just two towns: Utoro on the west coast and Rausu on the eastern. None is nice or has anything agreeable besides the nature that surrounds them, the hot springs and the welcoming ryokans. These two villages appear as agglomeration of concrete blocks, soulless, as Japanese towns often look. In Rausu I slept at the campsite. It was summer, but it looked completely abandoned. It’s probably a place that hosts big groups sometimes, but I was almost alone. It wasn’t easy to find it: I had to ask around a bit to find it, as nobody seemed to know where it was. It’s on the top of a hill and for a lonely traveller with a huge backpack was a bit inconvenient to reach it on foot. Much better was the experience in a minshuku. I really loved Ishiyama minshuku, a family-run pension. A bit pricey, maybe, but, I felt really at home and it was great to meet the other guests and chat with them. The food was great too, among the best ever had in Japan. Once, one of the main attractions of a trip to Shiretoko were the falls of Kamuiwakkayu, one of the ultimate onsen experiences in Japan. The country has a famous and wide choice of incredible hot pools, spa resorts, sometimes of unbelievable beauty. But this is something different. We are talking about a river of hot thermal water where one used to be able to bathe under a waterfall in the nature. Kamuiwakka falls are 10km north of Utoro, at the end of a gravel road. In august the road is closed to private cars and a shuttle bus runs between the falls and the Information centre. In other periods it’s not easy to reach them if you don’t have a car. Check Japan Guide for updated info. You can also enjoy the beautiful, but much more ordinary, onsen baths in Utoro. It has nine nice hot springs facilities, some with outdoor baths. Here you can find some reviews. There is a number of day hikes, ranging from very easy walks to demanding trails that require to camp for one or two nights. But when I set out for Shiretoko my plan, maybe a bit reckless, was to do a solitary hike. I wanted to do the Shiretoko trail. It’s a ridge trail that touches five peaks (getting quite close to an active volcano) and requires to camp overnight. But adverse weather conditions (heavy rain and low clouds right on the crest) all but prevented me from trying it. Luckily, I might add today. The same bad weather conditions made it also impossible the much easier ascent to Mount Rausu, to my great regret. If you want to do the ridge trail, which is suitable for expert hikers, it is better to send an email to the parl to ask if it’s viable. When I went some sort of authorization was needed. Write in English (or Japanese) to abashiridoboku.kanri1 @ pref.hokkaido.lg.jp. But even if you are authorized, keep in mind that it can only be done in the summer, and that landslides and even eruptions are possible. Bears are also present in a big number. Locals recommend to attach a bear bell to your backpack. You will obviously need food and water as there are no huts on the trail. More information can be found on the very useful Lonely Planet Book Hiking in Japan and on Wiki travel that also lists some day hikes. I also wrote about the Shiretoko trail in my book Horizon Japan. A very easy walk, suitable for families, yet one of great beauty, is the path that touches the five lakes of Shiretoko (Shiretoko Goko). The rules for this hike change according to the season and the reported activities of bears. In July a guided tour was mandatory (Japanese only, alas). The nature around the lakes is wonderful and we got to meet deers and different species of birds. More information on the park website. Seeing wildlife in nature can be an unforgettable experience. Therefore when I read that one of the most popular activities was bear watching from a boat, I immediately decided to have a go at it. 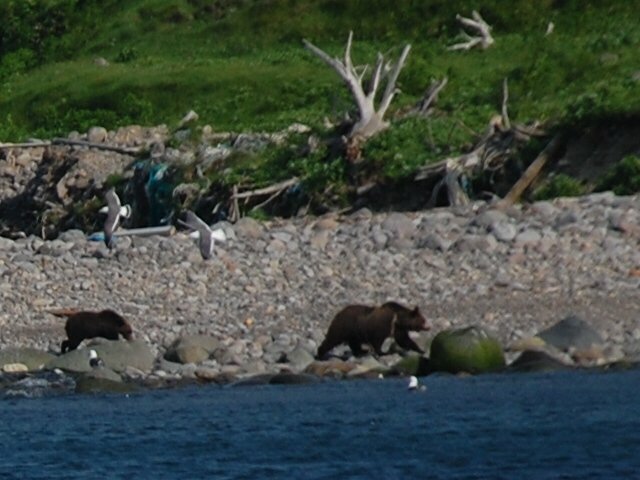 It’s relatively easy to see bears from the coast in Shiretoko as they often amble on the beaches and fish in the streams. And there are many bears, believe me. There are various companies offering different sightseeing tours of various length on small boats. Some go as far as cape Shiretoko (Shiretoko misaki), some are shorter two hours tours. I went on a tour with Cafe Fox, which is an Internet Cafe located just in front of the docks that also organizes some activities in the area. And I did see bears, eight of them. And cubs. It was wonderful. Bears in Shiretoko are no grizzlies. They are smaller brown bear related to those found in Russia but they are quite a sight anyway. From what I have seen tours can be booked on the same day. a bear watching experience from Taiken Japan. Shiretoko is great for whale watching. Killer whales, sperm whales and others can be seen often. The tours start from Rausu, on the eastern side of the peninsula. At the time of my visit the tours where only in Japanese. But the trip didn’t disappoint me at all: we did see a sperm whale, dolphins and other whales (but I didn’t quite get the Japanese names). Shiretoko is also the southernmost point in the world to see floating ice. It can be typically seen from January to March. The closest train station is Shari, about seven hours from Sapporo and 40 km from the park. Much more convenient is the night bus from Sapporo (4.500 yen when I took it) that will take you directly to Utoro onsen, in the middle of the park. The closest airport is Memambetsu, 100 km west of the park. It has direct flights to Osaka, Nagoya, Tokyo. If you have a car, keep in mind that Shiretoko gets a lot of snow during winter and some roads are closed from november to april. You should, normally still be able to reach Abashiri, Shari and the main towns, though. I wrote about Shiretoko in a chapter of my book Horizon Japan. Do you know of any other book set in the area? Let me know in the comments.